In 1920, William C. McIntire of the Rose Theatre in Fayetteville, North Carolina, wrote a letter to William S. Hart, one of the world's biggest movie stars. "STARS MAKE A MISTAKE NOT HAVING THE YEAR, STAMPED ON EVERY FOOT OF FILM, And include in CONTRACTS AFTER TWO YEARS ALL OLD PRINTS MUST BE DESTROYED NOT RE ISSUED that is the JUNK killing the business. I have a lot of your old RE ISSUED pictures to meet as COMPETITION in my town." Fayetteville had turned into a nest of "snipers"-the industry's term for an exhibitor who cheaply booked one of a star's old pictures to open the same week that the star's expensive new production opened down the street. Hart did not need McIntire's letter to know that old films were a problem. From 1917 to 1920, he had engaged in a series of legal disputes to exert control over the manner in which his old films circulated. McIntire, in fact, wrote to Hart in response to an advertisement the star had placed in Exhibitor's Trade Review warning that the "bootleggers of the industry are at it again. Let us hit them right between the horns and prove our gratitude to that motion picture public which supports us. "The "bootleggers" whom Hart identified were distributors trafficking in retitled old films. Some distributors had legally obtained the films from their owners; other exchanges circulated pirated prints. Hart's struggle resulted in a Federal Trade Commission (FTC) investigation that established an important precedent-boundaries for the exploitation of film libraries. McIntire supported Hart's campaign against reissues, and he wanted the star to push it even further. The correspondence from McIntire to Hart challenges our common assumptions about the value of old movies in cinema's silent era. We tend to imagine a growth narrative in which old films were once considered worthless, then consistently rose in value due to the emergence of new technologies, such as television and home video, and new standards of critical appreciation. In popular histories and movies, such as Hugo (2011), we witness the destruction of old films. Yes, it is true that most producers took advantage of the roughly twenty cents per pound they could earn by recycling old positive prints that were worn out or no longer needed. Accountants in the 1910s and 1920s also fully depreciated films as assets within twelve months of release. It is also true that some producers considered the underlying negatives of their old films to be worthless, especially if the films lacked stars or production value. However, McIntire's proposal to destroy all star-driven films after two years speaks to a different marketplace reality. He perceived reissued old films as a competitive threat to the new ones. He wanted to destroy old films not because they were worthless but precisely because they still held market value. Hart's struggles, three FTC cases, and many of the industry's sniping problems of the period emerged because of the Triangle Film Corporation. Triangle and its successors, more than any other producer of the silent era, exploited their library extensively and widely. In the process, Triangle perpetrated both consumer and financial frauds. The FTC investigated the consumer fraud and unfair competition practices of a secretive Triangle enterprise called W.H. Productions, which retitled Hart's old films and sold them to states rights exhibitors. W.H. Productions was simultaneously part of a financial fraud carried out by Triangle's founder, Harry Aitken. Aitken's fraud and self-dealing resulted in a shareholder lawsuit and illustrated the way in which film negatives, as theoretically worthless assets, were ripe for financial manipulation. In her recent book Saving Cinema, Caroline Frick insightfully warns against assuming that silent-era producers did not value their old films. "Although apocryphal narratives of film preservation depict an easy villain in the studio decisions and policies that purposefully destroyed superfluous reels of film to reclaim silver before 1927," Frick writes, "the full story of how many films remain from cinema's first decades is much more complicated and difficult to piece together." In this chapter, I attempt to piece together one part of the story. It begins before the creation of Triangle, when several forces converged that forever changed the value of a film negative. Hart resented Triangle's program of reissues. The same historical developments that had turned him into a rich man, however, enabled the birth of a market for his old movies. Between roughly 1903 and 1915, four major developments fundamentally altered the value of a film negative, the basis for reproducing positive film prints. These were the growth of motion picture copyright law, the rise of the feature film, the dominance of the star system, and the emergence of new distribution infrastructures. In 1916, a Price Waterhouse and Company accountant noted that the previous several years had witnessed a sea change: a shift from the era of a "cheap negative"-in which the cost of making positive prints exceeded the cost of the negative from which they were based-to the era of the "high cost negative," in which creating the film negative cost far more than striking positive prints. By briefly examining each of the four contributing developments, we can better understand the emergence of the "high cost negative," the source of Hart's riches and problems. An absence of copyright regulations and an abundance of unauthorized copying marked the moving pictures' early years, from 1895 to 1903. "Copying was as much an industry practice as it was an industry problem," the film scholar Jane Gaines writes. Motion picture companies acquired the positive prints of competitors' films and "duped" negatives from them. The "duper," in industry slang, then used the dupe negative to make positive prints, which were distributed to a hungry exhibition market. Thomas Edison voraciously duped the works of foreign film producers, but he wanted more protection for his own films. The trouble was that no such thing as a motion picture copyright existed. Edison circumvented this legal gap by printing each individual frame of his films to paper and registering the entire chain under one photographic copyright. When the Philadelphia entrepreneur Sigmund Lubin persisted in making dupes of films that Edison had registered, Edison took him to court. Edison lost his case in the lower court, but the Third Circuit Court of Appeals reversed the ruling. Edison v. Lubin (1903) established that films could be copyrighted by registering an entire film as one photograph. The right to make copies from a film negative, in other words, was legally protectable under copyright law. The practice of registering paper prints for copyright protection also left a fortunate by-product: decades later, archivists at the Library of Congress were able to reconstruct films, frame by frame, that had perished in celluloid form but still existed on paper. Much of the body of early American cinema we can view today comes from the paper prints at the Library of Congress. Over the following decade, U.S. courts and legislatures enacted a series of changes to copyright law that effectively increased the protectability and potential profitability of a motion picture negative. In 1909, the U.S. Congress revised the Copyright Act, granting copyright protection to mechanical reproductions of music but not motion pictures-the result, Peter Decherney suggests, of film industry lobbying to continue to allow case law and self-policing, rather than statutory law, to regulate the industry. Yet despite cinema's omission from the Copyright Act of 1909, the revision included two changes that would prove essential for the future of film libraries. First, Congress doubled the period of protection. Prior to the 1909 act, copyright protection lasted fourteen years and included the option to extend for another fourteen. The 1909 act expanded the duration of copyright to twenty-eight years plus an optional extension of the same length. Second, the revision granted corporations the right to claim authorship of a copyrighted work, enabling greater leverage for companies producing "works made for hire." Congress amended the act in 1912 and formally recognized motion pictures as copyrightable works in their own right, rather than as photographs that moved, but the extended protection and work-for-hire provisions of the 1909 act carried long-term significance for the film industry, allowing studios to claim ownership of the works its employees created and, subsequently, retain the exclusive rights to exploit those works for a potential fifty-six years. Between the 1909 act and the 1912 amendment, the Supreme Court heard Kalem Company v. Harper Brothers (1911), a case that held enduring significance for film libraries. Copyright law grants the right to create derivative works-those based on a preexisting work. Ideas, however, are not copyrightable; only their expression is. Kalem v. Harper asked: Did a motion picture adapted from a novel infringe the literary author's copyright? Was a motion picture based on a novel a derivative work? Or could filmmakers liberally lift from the ideas of a novel, including characters, plot, and scenes, as long as they used silent pantomime instead of the literal words-the expression-on the page? Film producers around the turn of the century assumed they could freely take whatever portions of a book or play they desired. In 1907, the Kalem Company produced one such unauthorized adaptation-a one-reel film consisting of sixteen shots depicting scenes from General Lew Wallace's enormously popular 1880 novel Ben-Hur. Wallace's heirs, the novel's publisher, and the Broadway producers who had licensed the dramatization rights sued Kalem for copyright infringement. Kalem lost in the lower court but appealed twice, arguing that the film could not be considered a dramatization because motion pictures were mechanically recorded and not produced live. Writing for the Supreme Court's majority, Justice Oliver Wendell Holmes rejected Kalem's logic and established an important precedent. For Holmes, what was important was not the "mechanism employed"-the moving picture technology-"but that we see the event or story lived." An audience experienced a dramatization of Ben-Hur while viewing recorded images at the nickelodeon just as surely as while watching live actors on Broadway. Similarly, movie producers should have to license the rights to create a dramatization, a derivative work of a novel, just as stage producers were required to obtain the rights. Holmes's decision formed the basis for a motion picture adaptation right in literary works and forever transformed the value of film negatives and film libraries. What film producers lost in licensing fees, they gained in exclusivity; after obtaining the motion picture rights to a novel, a producer could confidently move forward, knowing that none of his competitors could legally produce a film based on the same work. As a result, producers invested more in the production and marketing of movies based on well-known properties. The name recognition of a famous literary work, combined with the right of exclusivity, functioned to distinguish certain films from the rest of the crowd, a form of differentiation that, like the casting of film stars, enhanced the value of certain film negatives. Kalem v. Harper held additional significance for film libraries: beyond the film negatives, a producer's library included all of the underlying rights that had been acquired to make the film. These rights could be used to produce a remake or a sequel or sold off to another producer. Underlying literary rights have repeatedly proved to be one of the greatest assets of film libraries, but ambiguity over which rights were acquired has also jeopardized library exploitation. As we will see, producers and their contract lawyers through the early 1930s failed to anticipate the full range of uses that their libraries might one day enjoy. Although motion picture copyright law offered formal protection for film libraries, it was the star system more than any other development that gave producers negatives worth saving and protecting. From the mid-1910s through the late 1960s, the most consistently lucrative films in a library were those featuring stars whose popularity had increased in the years following the pictures' initial release. At first, the film manufacturers (the term producer was later used more) of the nickelodeon era were apprehensive about promoting films based on their stars. Although star systems were present in theater and vaudeville, manufacturers wanted motion picture audiences to stay loyal to the manufacturer's brand rather than to actors, who, if famous, might demand more money or defect to a competitor. Audiences frequenting the nickelodeons, however, formed attachments with the people they watched on-screen. They wrote to the studios seeking to know more about the people they watched. What were their names, backgrounds, loves? By 1909, savvy manufacturers had recognized that centering films on popular actors and supplying the public with information about those actors helped to differentiate their films from the others in the marketplace. In other words, the film negative featuring a star was a more valuable asset than the negative without the distinction of a star. Several producers in the mid-1910s found themselves in an enviable position, owning negatives that featured actors whose level of stardom (and salary) had skyrocketed since the production of those negatives. Thanks to the work-for-hire doctrine, the producer could capitalize on those old negatives and reissue the films. The Fayetteville exhibitor who proposed stamping dates on every film frame and destroying films after two years resented this practice. A competitor who booked a reissue received the benefit a top star offered-product differentiation-but for a fraction of the price. Destroy old movies, the big exhibitor urged, because they still held market value. For a producer, however, the entire reason to keep old films in the first place was because they might prove to be valuable again. Sure, some filmmakers and stars, including Hart, carried sentimental attachments to their films. But from a business perspective, old movies were worth the storage costs and fire risks only if the producer believed those liabilities were less than the future earning potential of the film assets. Producers knew that some films in their growing libraries would have long-term reissue value. But which films? Which young player whom you hired as an unknown would emerge as tomorrow's star? The answers could not be known at the time of production. Only a handful of films in your library might have future value, but you never could be sure about which handful. Storing many worthless negatives was necessary in order to capitalize on the few that would prove to have remaining market value. Copyright law gave producers legal control over their libraries, but in practice, pirated prints circulated widely. Producers needed to innovate a new distribution system, one that enabled them to receive a greater share of revenue and exert more control over circulation. The explanation of how this system developed is complex, requiring us to consider the early film business, the rise of the feature film, and especially the rise and decline of the Motion Picture Patents Company (MPPC). Between 1908 and 1915, the MPPC provided stability for the burgeoning film business, expanded the domestic market for films, and innovated several important distribution strategies. It was a monopolistic venture-intended to control the American film industry through the pooling of patents and by demanding that producers and exhibitors acquire the licenses to those patents. Yet this trust ultimately failed, and not merely because the U.S. Supreme Court found that its practices violated the Sherman Antitrust Act. The MPPC's internal conflicts, ineffective campaign of patent litigation, production budget limitations, and distribution structure-based on supplying short films to small exhibitors-made it unable to keep pace with its rivals' booming business of star-driven feature films. During the nickelodeon boom of 1905 to 1907, the profits for film distributors (known as exchanges) far outpaced those of the films' producers. As Scott Curtis explains, the exchanges operated so profitably because they purchased prints outright from the producers. An exchange might recoup the purchase price after only five rentals; every one beyond that was gravy. To maximize profits, exchanges were known to peddle prints until they literally fell apart, upsetting exhibitors who found themselves with unplayable or "rainy" (the industry jargon for badly scratched) films. Some exchanges did not even bother to purchase new prints: they duped films already in circulation or acquired another exchange's old or duped prints. In this climate, producers had no reason to invest significant money in the production of film negatives. Even for a popular picture, most of the money would line the pockets of the exchanges that owned and rented out the prints. The positive print was king. To obtain a grater share of the profits, the large American film manufacturers persuaded Edison to call a détente on the patent litigations and enter into a cooperative agreement. From 1908 through early 1909, the shape and structure of the MPPC were ironed out: Edison and his chief rival, Biograph, agreed to pool their patents, which covered technologies essential to nearly every aspect of cinema; several other manufacturers-Kalem, Essanay, Vitagraph, Lubin, Selig, and Pathé Frères-and one importer, George Kleine, joined the pool as licensee members; Eastman Kodak agreed to sell raw film stock exclusively to the MPPC manufacturers; and finally, films were to be rented only to those exchanges and exhibited only by those theater owners that paid a weekly license fee and stayed in the good graces of the MPPC. The word rented is important here-one of the MPPC's greatest innovations was renting films to exchanges rather than selling them outright. The rental model allowed the manufacturers both to obtain a larger chunk of the earnings and to maintain a level of quality control, by removing old, damaged prints from the marketplace. The MPPC was, to be sure, a cartel designed to monopolize and control the American film industry. However, this trust also provided stability for the burgeoning film business, enabling the rapid expansion of movie theaters from roughly 6,500 screens in 1909 to an estimated 15,183 in 1913. Licensee theaters could count on a dependable supply of one-reel films to fill their variety programs, which they changed daily and which generally consisted of three reels of different genres, interspersed with some song slides and live entertainment. The manufacturers could count on a dependable base of film sales, enabling them to produce more one-reels. Prior to the MPPC, European imports had dominated American screens. The trust changed that balance of power: not only did domestic films now outnumber imports, but American films were increasingly competitive in foreign markets. One year after its formation, the MPPC changed its distribution model. Exhibitors had continually complained about exchanges renting poor prints and employing discriminatory practices (many exchanges also owned theaters, so they sold themselves the best product and rented the inferior goods to other theaters). In response, the MPPC made the exchanges an offer they couldn't refuse: sell out to the MPPC or lose your license. The MPPC thus acquired fifty-eight exchanges across the country, forming the infrastructure for a national distributor known as the General Film Company (GFC). The GFC codified many of the distribution practices that earlier cooperative arrangements, such as the Film Service Association (FSA), had formulated but could not enforce as effectively. Distributor favoritism was curbed. The GFC removed worn-out prints from circulation and maintained control over playable old prints, which the exchanges had all too often covertly sold or subrented. For our purposes, though, the GFC's most important innovation was its pricing system, based on release date and flat rental fees. Through this system, we can understand how the MPPC enhanced the value of film negatives yet imposed structural barriers that limited their potential earnings. Like the earlier FSA exchanges, the GFC set prices on a sliding scale based on a film's release date. A brand-new one-reeler in 1914 cost an exhibitor $7.50 per day, but that price quickly fell, bottoming out at as low as fifty cents per day a little over a month after the initial release. Small to midsize exhibitors frequently booked mixed programs-mingling not simply genres (one comedy, one chase, one melodrama) but ages (a new release, a one-week-to-one-month-old reel, and a film in release longer than thirty days). Distributors and exhibitors assumed that audiences wanted novelty in their screen entertainment. Granted, few of the successful films of the 1910s were completely new; they featured familiar genres, stars, and stories, participating in a tradition of entertainment that cultural critics have long identified as balancing "repetition and difference." But the "and difference" part of that equation was important. Although studio libraries in the early twenty-first century represent huge profit centers because of the many markets for exploiting old films, the movie business continues to organize itself around the release of new films, and the price points still cascade as the films age and work their way through a series of release windows. Standardization was the second component of the GFC's pricing system. Manufacturers were paid by the foot for every print they delivered. The GFC then rented the films to exhibitors at a standard per-reel rate. The GFC had its reasons for instituting this system. It calmed exhibitors, who had complained for years of uncertain supply and discriminatory pricing, and initially helped manufacturers, who could calibrate production volume and budgeting to a market in which they could accurately predict their returns. The business model, however, was shortsighted. Whether a one-reel production cost one hundred or one thousand dollars, the manufacturer received the same set rate-somewhere between eight and eleven cents-per foot of positive film it delivered. Similarly, the exhibitor always paid the same per-reel rate. Manufacturers shared in exhibition revenues only indirectly-successful films sold more prints to the GFC-and had little incentive to invest in more expensive, ambitious productions. More problematically, even if you changed the per-foot payment equation, the overall distribution structure, built around the needs of the small exhibitor, limited the amount that any film could gross. Since exhibitors changed their programs every day, they seldom purchased local advertising for a particular film. Nor could they hold over a popular film for a few extra days, since the print needed to be delivered to another nearby movie house, the real beneficiary if the first exhibitor made the miscalculation of buying a newspaper ad that raised public awareness of the film. The trust's structural decisions became fatal flaws as independent producers and distributors undeterred by its litigation became increasingly competitive, by exploiting feature films. Today we generally think of feature films as movies that run an hour or longer, but as Michael Quinn points out, the industry's original definition revolved around not length but product differentiation. A feature was something special, a film distinguished by its production values, source material, or beloved star. Independent producers made one-reel features, such as the 1914 Keystone films starring Charles Chaplin. Once audiences started demanding more Chaplin in 1914 and 1915, Keystone's distributor, Mutual, began selling his films for a premium. Independent producers also made two-reel features, such as the twenty-one westerns that Thomas Ince produced from 1914 through mid-1915 starring his old friend Hart. Soon, though, length became an integral aspect of the feature film; the standard was five reels (around seventy-five minutes), but others were longer. The top-tier features played for days or weeks in opera houses, legitimate theaters, and a growing number of specially-built movie theaters that seated fifteen hundred people or more, several times the number that a small movie house could hold. Features played longer, to bigger crowds, who paid more per ticket; the potential returns on a single film were dizzying. But those returns were possible only if the distribution system permitted them. As the MPPC member companies lost market share to independent producers and distributors and declined in productivity, their distributor, GFC, flooded the market with reissues of one- and two-reel films. In 1915, Kalem reissued single-reel pictures starring Carlyle Blackwell and Alice Joyce. In 1916, fellow MPPC members Essanay and Lubin similarly put old films back into circulation. And in 1917, as Jennifer Horne has pointed out, Edison and George Kleine included a number of four-year-old films shot in exotic foreign locations in their "Conquest Pictures" program, which also included many new films. For years to come, Kleine attempted to market the "Conquest Pictures" based on the films' alleged educational merits. The MPPC member companies established a pattern that numerous other film companies then followed-turning to the library as a last-ditch survival strategy after losing their ability to meaningfully compete as market leaders. Of all the MPPC members, Biograph pursued the most effective reissue strategy. In the summer of 1915, it began weekly reissues of one- and two-reel pictures directed between 1911 and 1913 by a film artist whose reputation had recently rocketed skyward-D. W. Griffith. No single film represented the ascendance of the feature film, star system, and post-MPPC industry more than Griffith's The Birth of a Nation (1915). Griffith had directed more than four hundred one- and two-reel films for Biograph, but Birth was a project on an altogether different scale. A three-hour epic of the Civil War and Reconstruction, The Birth of a Nation was an immediate sensation, acclaimed for its artistry and emotional sweep, attacked for its vile racism. Audiences rushed to see the lightning rod of controversy for themselves. Griffith road-showed the film across the country; these theatrical engagements featured a large orchestra, reserved seating, and higher ticket prices than were typical for first-run attractions. The film contained stars-Mae Marsh and Lillian Gish, among others-but the real star was the film's director, who received extensive coverage in the press. After months, years, and eventually decades of controversy, The Birth of a Nation grew to be much more than the sum of its parts (Griffith, Marsh, Gish, etc. ), and its reputation became its biggest selling point. But even from those first road-show engagements with inflated ticket prices, The Birth of a Nation clearly rebuked the logic of the MPPC. The trust had pretended that all new films were equal, insisting that distributors pay producers and exhibitors pay distributors a standard rate based on feet of film. The positive film print was king. The trust told you what a new, a one-month-old, and a three-month-old foot of positive film was worth; it didn't matter what stars, inputs, or production costs went into creating the film negative. Audiences, however, wanted to see some reels of celluloid more than others, and they would pay more for the privilege. The Birth of a Nation-containing more feet of film and worth more in the marketplace than any American feature before it-marked the triumph of the film negative. "We now take for granted that the 'aftermarket' for movies is far more important commercially, and perhaps even culturally, than theatrical release—that the “long tail” of TV and home video and digital streaming now wags the dog. 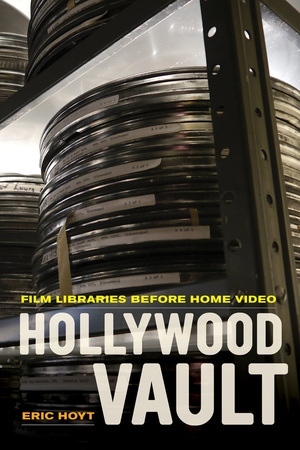 In this groundbreaking book, Eric Hoyt provides us with an incisive, in-depth, and invaluable backstory to this crucial industry development, explaining how and why the studio vaults of seemingly worthless old movies steadily transformed into libraries of untold worth."